Inappropriate inflammatory responses lie at the root of allergic reactions. Allergic reactions involve proinflammatory molecules and immunoglobulin antibodies stimulating immune cells like basophils and mast cells. These cells release signalling molecules like histamine. Histamine allows fluids and immune cells into tissues, which causes symptoms like stuffy nose and watery eyes. The best way to combat allergies is to treat the inflammation that initiates the allergic response while also treating annoying symptoms so that you can get on with enjoying life. 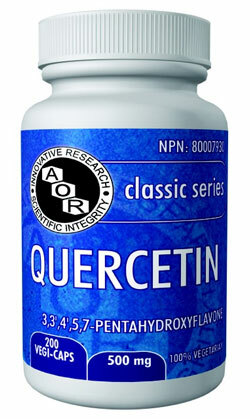 AOR offers several products that target allergies including Quercetin and AllerQue. The flavonoid quercetin counters allergic reactions by stopping an allergic response from developing in the first place. As an anti-inflammatory, it inhibits enzymes responsible for producing inflammatory mediators and inhibits histamine release by stabilizing mast cells and basophils. Quercetin is widely used by those who suffer from regular and seasonal allergies. Quercetin is available from AOR in two sizes. AllerQue is AOR’s prime allergy formula, with ingredients to help prevent allergic reactions and ease allergy symptoms. AllerQue is especially suited to allergic responses where headaches and respiratory distress are concerns. In addition to quercetin, AllerQue contains rosmarinic acid and butterbur. Rosmarinic acid, found in rosemary, helps relieve the common allergy symptoms of itchy nose, itchy and watery eyes, and headaches, potentially providing global symptom relief. Rosmarinic acid works by inhibiting proinflammatory molecules and inflammation through several mechanisms, giving it a unique edge. Butterbur shrub extract has been compared to the antihistamine drug Cetirizine for seasonal allergic rhinitis, likely due to its effectiveness at reducing nasal responsiveness. Luckily, butterbur does not have the sedative effect associated with the drug. Butterbur may improve lung and bronchial function in asthma and bronchitis. Migraine occurrence, duration and severity may also improve thanks to butterbur.